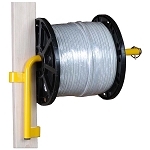 ReelCraft Reels are made to power or light to your garage, workshop, or job site without the constant clutter of unorganized extension cords. 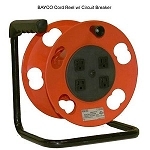 These retractable reels are ceiling and wall mountable saving you precious floor space, and for easy clean-up simply retract the cord using its built-in spring latch, or hand crank depending on your model. 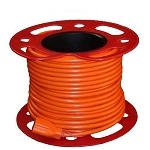 A lightweight cord organizer in a bright visible orange color. 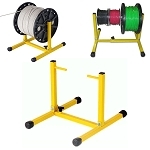 Cable Reel systems to wind up and wrap cables. 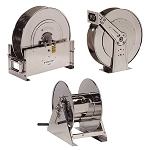 Stainless Steel Hose Reels that are ideal for a multitude of uses. 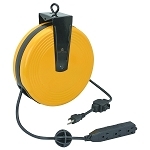 The Reel Stand holds a 1,000 foot reel of 10/2 or three reels of THHN wire that are five inches wide. 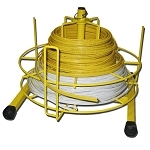 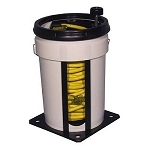 The Coil Reel Stand holds more than one coil of wire for trouble-free dispensing.